You may have noticed that when fountain pen ink gets wet, it can sometimes separate out into different colors. This might happen when you’re cleaning your pens or just playing with some ink and water on paper. The reason this happens is because ink can be made up of different base colors. For example, green ink might consist of both yellow and blue dyes. 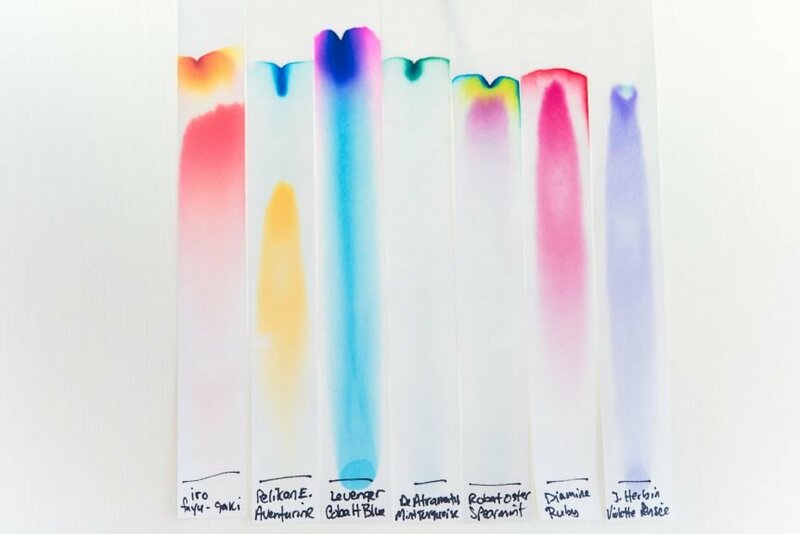 In this article I want to explore fountain pen ink chromatography to get a better understanding of the colors that make up different inks. You can see that the ink color is much different than the chromatography. This might look familiar if you took a high school chemistry class. 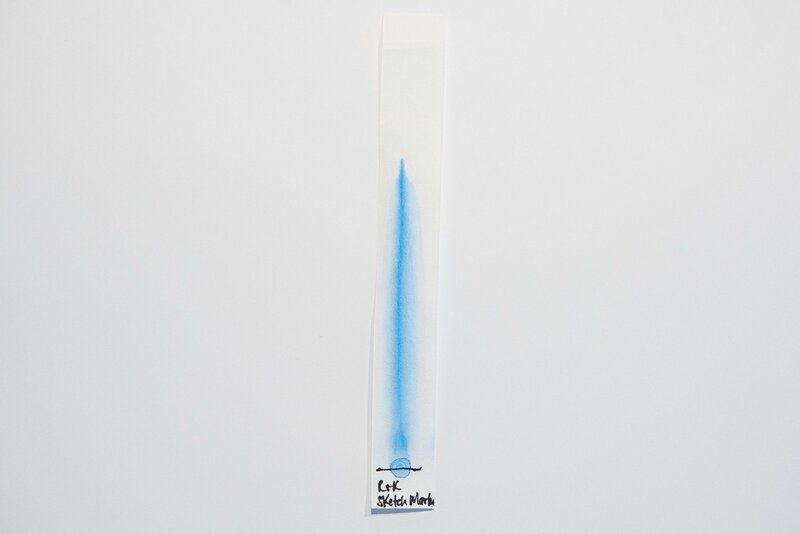 In this example, I’ve used chromatography paper and water to separate out the dyes in the ink. You can see that while the ink looks green on paper, it is actually made up of two different colors… blue and yellow. This is much more common in more complex colors. For simple colors that are much more “pure”, like ordinary reds and blues, you won’t typically see any color separation (although you might be surprised at how often you’ll see colors that you didn’t expect to see). This blue ink doesn’t have any additional colors in it. 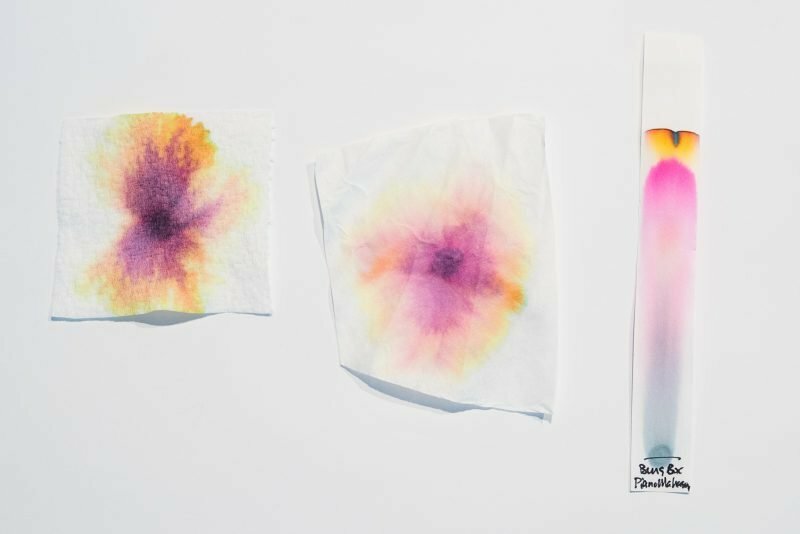 So do you need special paper to try chromatography for yourself? Fortunately, you don’t! Chromatography paper just makes it easier to do. If you don’t want to buy any, you can use a coffee filter or a paper towel instead. 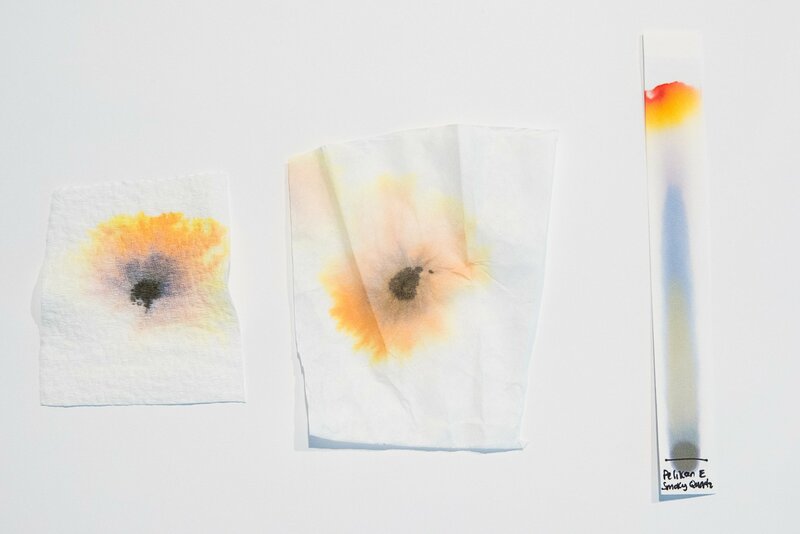 A paper towel (left) or coffee filter (middle) can achieve a similar result to chromatography paper (right). You can also achieve a similar effect using watercolor paper. This has become very popular with many fountain pen users lately. Artist Nick Stewart has been making amazing inky “landscapes” using watercolor paper, water and ink. This process also allows the dyes in the ink to separate and become visible. Many pen and ink enthusiasts, myself included, have taken inspiration from this process to play with water and ink and see what happens. I keep an ink journal of all of my inks and for each entry I also do a chromatography strip. When two colors look very similar but I like one more than another, looking at what colors make up the ink can help me see the color difference between the two. While it might not be extremely helpful when buying inks, it has helped me to be able to start seeing the differences between similar ink colors. 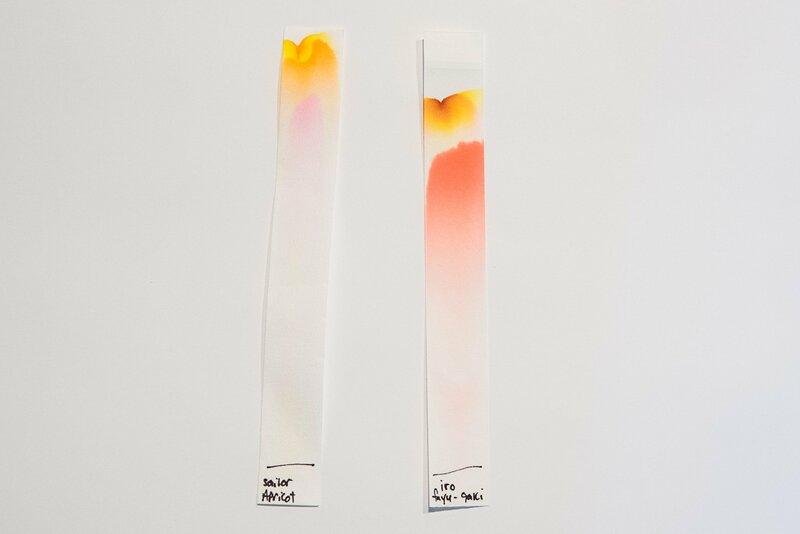 These two inks look similar on paper, but you can see their chromatography has different color distribution. 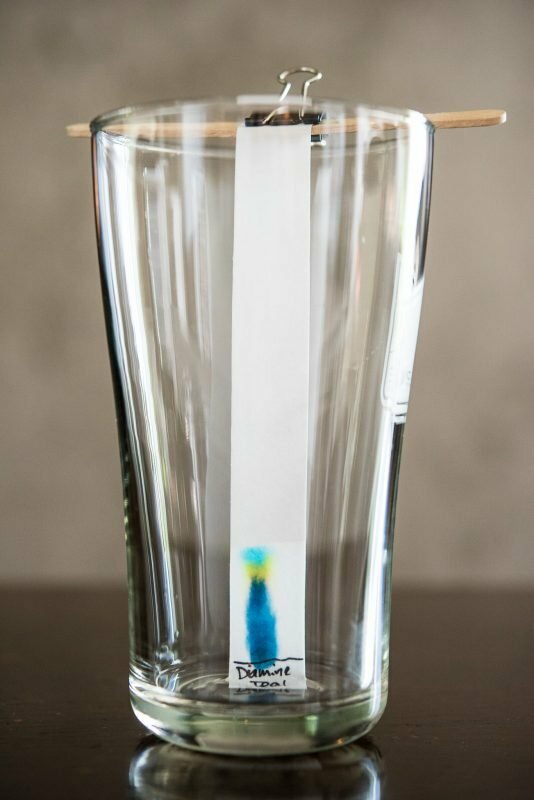 Chromatography can also be a fun science experiment you can do with your kids. Not only do they get to play with ink and water, but they also get to learn about color combinations and see that ink is more than just colored water. When I use the chromatography strips, I use a binder clip to attach the paper (which is already inked) to a popsicle stick. I then put the stick across the top of a glass with just enough water in the bottom so that it touches the paper. Remember, you want the water to be pulled through the ink sample, so don’t completely submerge the paper. I like to draw a line across the paper where I put the drop just to see how much progress the ink is making. To do this I use a Sharpie, which isn’t affected by the water and won’t alter the results. Once the paper is in the water, I wait for anywhere from 5-15 minutes, depending on how the ink is separating. I usually let the ink get close to the top of the paper, but you should be able to easily see it separating well before that. Make sure to wait so that all of the colors separate out. If you use a paper towel or coffee filter you can use the same process, but you can also do it laying flat. Simply add a drop or two of water to the ink sample. This will cause the ink to spread out in a radial pattern, but the results won’t be affected. 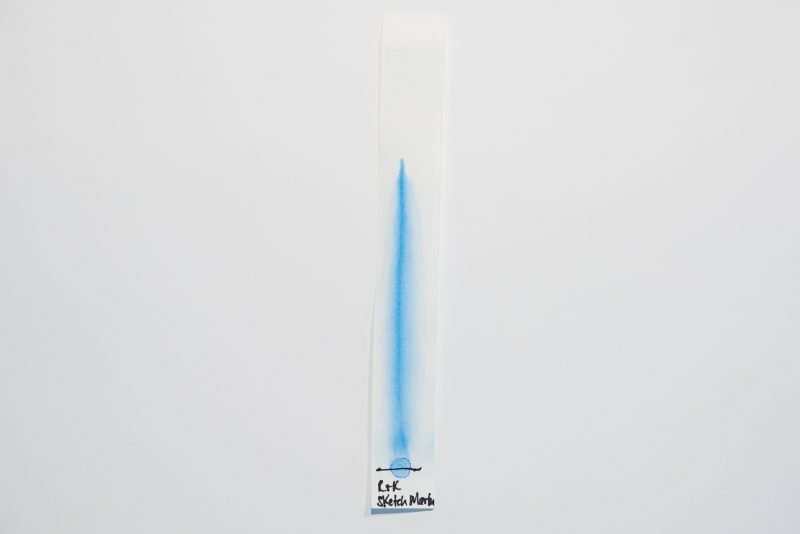 You’ll probably notice that the results aren’t nearly as precise as those using chromatography strips. 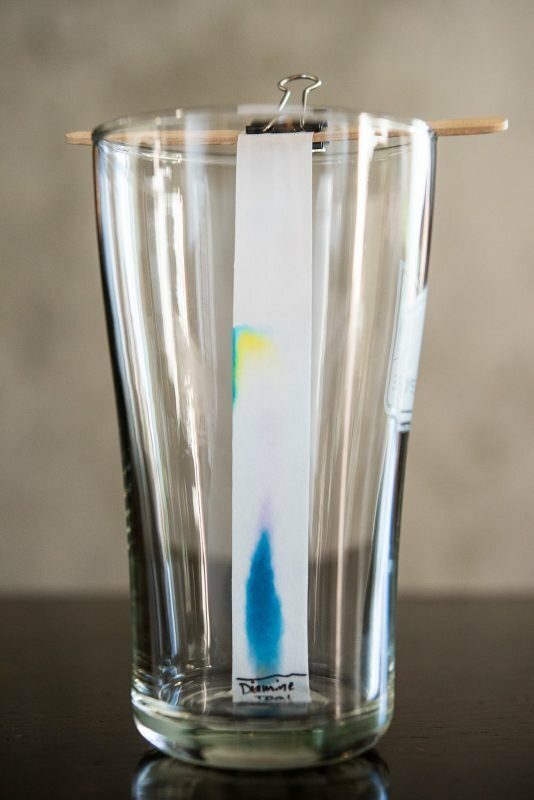 This is because both paper towels and coffee filters soak up liquid very quickly, while chromatography paper is specially designed so that liquid is absorbed slowly and the dyes separate out much more uniformly. You can see the results are much better with the chromatography paper than with the paper towel or coffee filter. 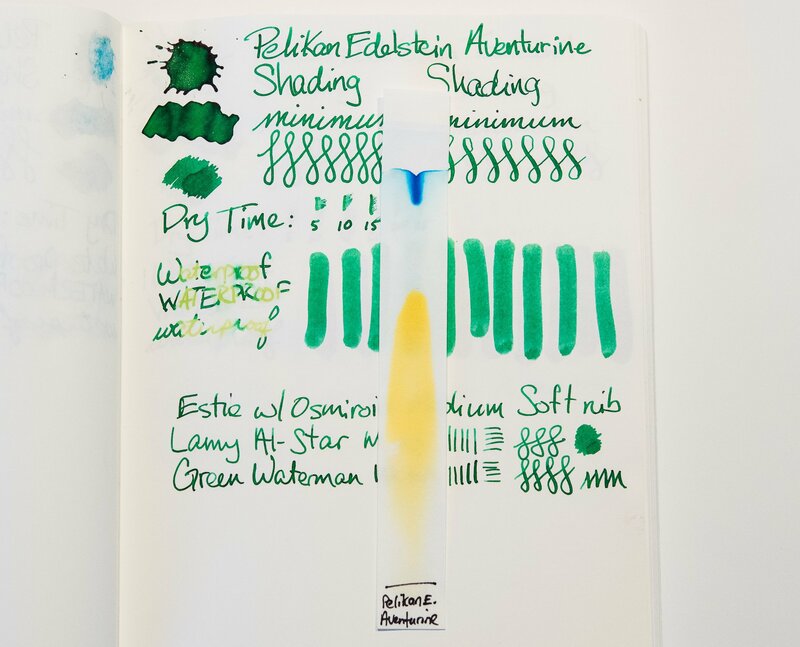 If you’ve never tried fountain pen ink chromatography (or even heard of it), it can definitely be a fun experiment to try. 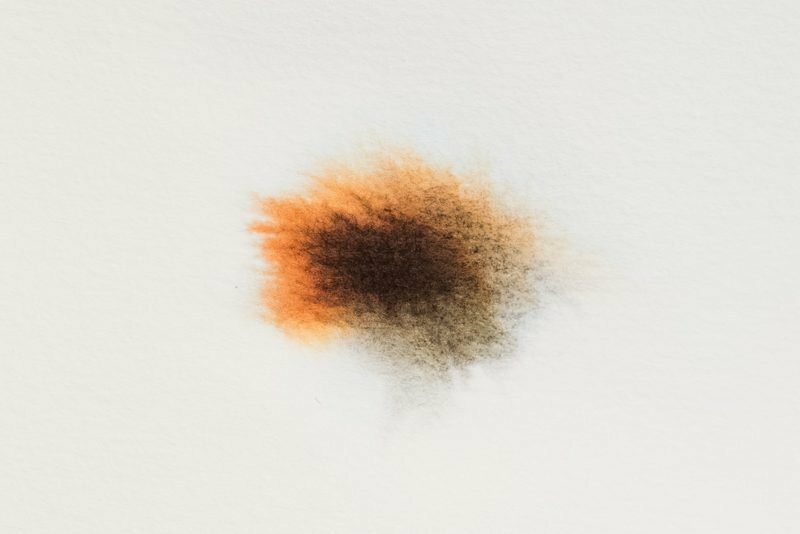 While not all inks will be exciting, some will surprise you with the number of different colors that unfold from a single drop. Of course, this isn’t something that’s going to improve your handwriting or make the pens you buy any less expensive. It’s purely something fun and educational to do. I’m sure that if you give it a try you’ll be pleasantly surprised by the results and will enjoy the process. If you’re interested in trying out chromatography for yourself but don’t know where to get the paper, I get mine on Amazon. If you have a science supply store near you, they should also have it. John – I searched for chromatography paper on Amazon (UK) and found only General Purpose Filter Paper and Blotting paper. Will they be good enough? Your Amazon link doesn’t point to anything. Noel, the blotting paper definitely won’t work, as it’s made to absorb liquid very quickly. The filter paper should be similar to a coffee filter. I updated the link, so it should work now. Thanks for letting me know! This is so cool – and love the idea of an ink journal. Do you have a bound notebook and particular paper you use for it? May need to start one. Thanks for a great read (much less stressful than reading the news in the morning). Amelia, I use a Tomoe River notebook for my ink journal. It’s a great way to see what inks I have and how they look when used with particular pens. I’ll write a post about it to give you a better idea of what it’s like. Thanks for reading! Great article. Used link from Ink Journal. Will order strips from Amazon. Have been using coffee filter paper. Inconsistent results. Thanks for sharing. You are very welcome, Chris. Good luck with the chromatography strips! I love this John! Having been a laboratory scientist for 35 years I have actually done chromatography for drug screens. I have always liked the “magic” so you can bet I am going to burn through a lot of coffee filters! Thanks for the chemistry love! I’m glad you found it inspiring, Cindy! I hope you have fun mixing your career and your hobby. Enjoy! Thank you for creating and sharing this beautiful, peaceful, creative project, as well as sharing the work of others. I know the writing and photographing etc. takes thought and effort and it is so soothing to see something that engages one’s curiousity and creativity right now. You are very welcome, Rachel! I hope you get some time to try it out for yourself. I appreciate the kind words and you taking the time to read my blog. Many thanks for explaining this process. I’ve also been amazed at Nick’s work and a number of ink reviewers who have used chromatography as part of their reviews but this is the first time I’ve seen anyone describe how to do it. I love how the ink separates out on the Col-o-Dex paper I have so this was something I was wondering about, but hadn’t got round to exploring. Now I will. Many thanks for reading, Cathy! It’s a fun process to experiment with and, as you’ve found out with the Col-o-Dex paper, you don’t necessarily need special equipment to do it. Have fun exploring! They would not ship my Amazon order (CHROM-50-6X75 – Chromatography Paper Strips from PRECISION LABORATORIES SE) to me as they can only ship a business address due to a feature of the paper, poisonous I think. I didn’t have one so they cancelled ordered. How did you order yours? That’s really strange, Chris. I’ve never had any issues ordering them and I live at a residential address. I haven’t tried to order those particular strips, but it doesn’t say anywhere in their shipping policies that they won’t ship to a residential address. The paper isn’t poisonous as far as I know. You might try ordering a different item and hopefully you’ll have better luck. On Amazon, just ordered Chromatography Paper from Frey Scientific. Hopefully I’ll get these.